At one point in my life, I looked forward to my birthday. Hey, I got presents and who doesn't like presents? It was especially fun since we had a large group of friends who would "chip" in to get a killer gift. Well, sadly those days are gone since everyone has their hands full with kiddies (and their gifts). Furthermore, as every year passes by, it just serves as a reminder of our advancing age. Viv thinks that I have not mentally aged since 20, so at least I can stay young in theory. 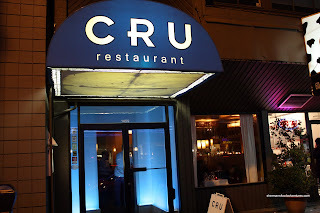 Tonight, we decided to celebrate my birthday a bit early at CRU. Bubbly M had been here before and decided to join us as well. Yah, it might seem a bit strange to have another couple celebrate my birthday with Viv; yet, that's what we did with Bubbly's birthday last year at the Hart House. Viv and I shared a few items starting with the Smoked Albacore Tuna. 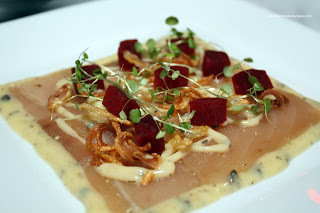 Visually appealing on the plate, it was topped with beats, crispy shallots, micro greens and truffle vinaigrette. Honestly, no complaints here. The combination of subtle smokiness, the crunch and aromatics of the shallots, the tender beets and the smooth citrusy vinaigrette was an illustration of balance. If the tuna was balanced and gentle, the "Cellar Door" Caesar is a bold version of the usually standard salad. With grill ed romaine and an obscene amount of shredded asiago, this Caesar is not devoid of flavour. However, the real star is the garlic butter croutons. Probably prepared with excessive amounts of butter, these large bad boys are crispy and melt-your-mouth goodness. This salad is absolutely delicious. 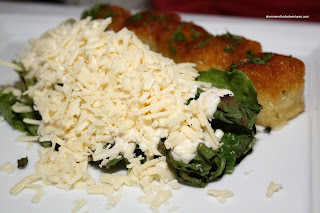 Only thing negative I can say about it is that the large amount of asiago completely dominated the flavour profile of the salad. Mind you, that is probably the intention as well. s ubtle than its appearance exhibiting smoky and red wine qualities. The mac 'n cheese was a total miss, it was way too salty. 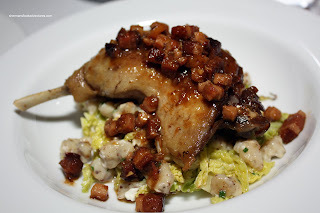 Our food didn't stop there, we also shared the Miso-Marinated Sablefish. Since it's so expensive, the portion size was predictably and understandably small. The perfectly cooked fish was tender and melted in our mouths. We felt that it was a bit salty (a bit too much miso). 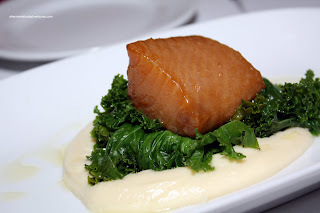 The sauteed kale was absolutely perfect being fully cooked while still retaining a slight crunch. Good thing too since the cauliflower puree was ultra smooth and understated taste-wise. 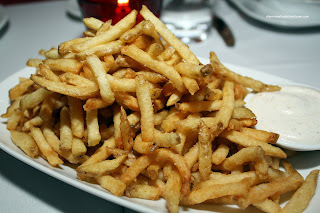 Our last dish was the Hand-Cut Fries with dijon aioli. The extremely generous mound of fries were crispy with very little in the way of potato-ness. Didn't matter in this case since they were good nonetheless. We ended up passing them over to M&M because they were famished. Why you might ask? Well first of all, their dishes were not very filling. 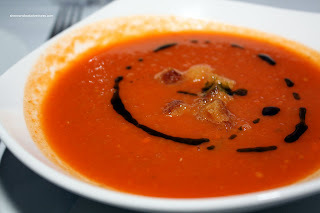 Bubbly had the Tomato Soup to start. Unlike the typical version, this one was a tad chunky which gave it a nice texture. It was a bit tart, not too sweet and had an underlying spiciness. The crisp croutons were a nice compliment to the soup. 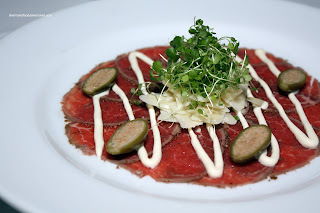 Chill had the Beef Tenderloin Carpaccio to start. I did not get to sample this dish since Chill is a big eater and he needs all the food he can get. Once again, much like the time at Pied-a-Terre, all I got out of him was "good". Then came the wait. In fact, it was roughly a 45 minute wait until their next dishes arrived. However, this was mostly due to the fact we didn't get our order in on time before the large party. Our server did apologize many times for the delay. Finally, they each received their order of sablefish. Unfortunately, their portion sizes were smaller than ours. 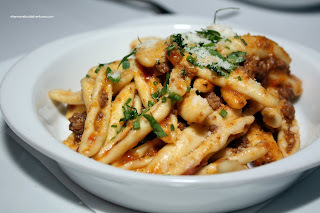 Bubbly also had the Cavatelli Bolognese which was prefectly al dente. The shape of the pasta helped hold the nice tomato flavour in its crevices. Personally, I thought the food was pretty good for the prices. On the whole, it was well executed and thought out. Service was attentive and friendly under the circumstances. Bubbly was not amused at the wait and thought that the situation could've been handled differently. However, I respectfully disagree with her since our entire party was not present at the designated time and thus, our order was not put in prior to the large party. She was quite adamant that she had a terrible time and that it was the restaurant's responsibility to keep all parties happy despite the large table. I do agree with that to some degree and possibly they could have provided some bread in the meantime; however, the rest of us didn't feel that it was really too big of a deal. 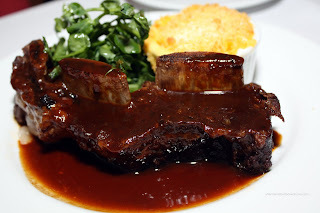 Ultimately, the food was good, atmosphere was simple; yet elegant and the service was solid. Yes, it was a good experience. i was surprised at the quality and solid execution of the food for relatively reasonable prices.